Lydia has done all the work for me for this Style-Diet Shot. Lydia is tip to top sustainable! 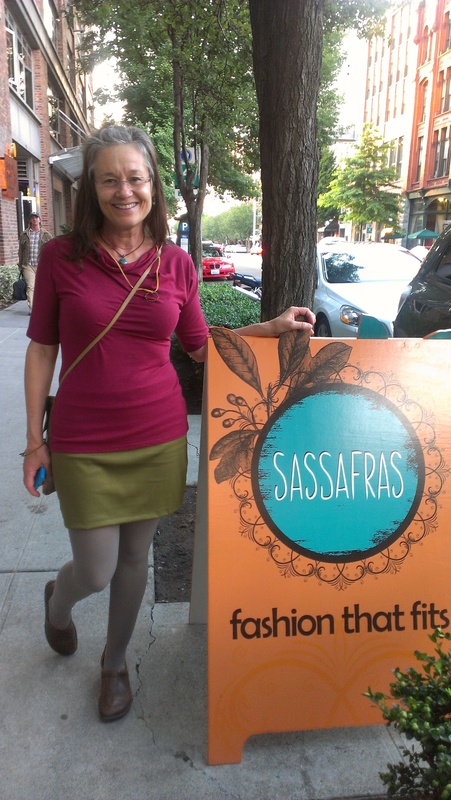 Lydia went shopping her a local, independent store called Sassafras. https://www.facebook.com/SassafrasSeattle Owner Amy actually makes some of the clothes sold there – the sewing area can be seen as one enters her shop. The top Lydia bought at Sassafras is from Hubris, a Portland company http://www.hubrisapparel.com/ Their products are locally-made in Portland and they use organic and sustainable fabrics as much as possible. The skirt is also from Sassafras. It’s from Clair Vintage Inspired. Her clothes are locally-made, http://www.alysonclair.com/ The purse was made by two lovely women artists in Salt Lake City. The tights came from American Apparel, famous for being sweatshop free. http://www.americanapparel.net The shoes are Borne, bought second-hand from CrossRoads Trading. http://crossroadstrading.com/ Both necklaces were hand-made by Lydia’s friends. One of the necklaces and the bracelet were made by First Nations artist Jennifer Wallen. They are made from cedar which she personally harvested and prepared before weaving. Kudos to the designers and craftspeople. More kudos to Lydia – thanks for putting it all together! This entry was posted in Fashion, Stephens Sister's Shopping Diet, Style-Diet Shot and tagged locally-made, lydia, organic clothes, re-purposed clothes, recycled clothes, second-hand, Stephens Sister's Shopping Diet, Style-diet Shot, sustainable clothes, Thomas Jefferson on September 3, 2013 by Gurdeep Stephens.